how we are hungry....no, really. wha--whey hey! whoa, nelly, wrong photo. keep on plucking. 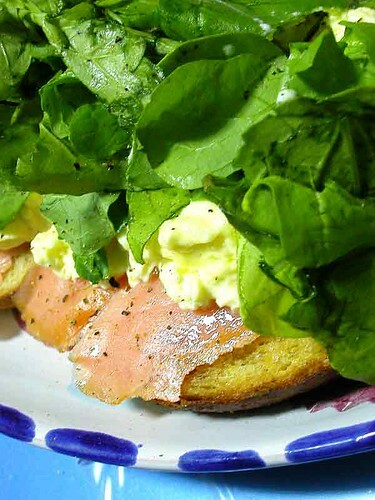 as i was saying, underneath all that watercress, there is definitely an egg on toast. and some unsalted butter, smoked salmon and freshly ground pepper too. not-so-respectfully submitted to eomeote #3.
mom is in the philippines at a family gathering (hi karen! 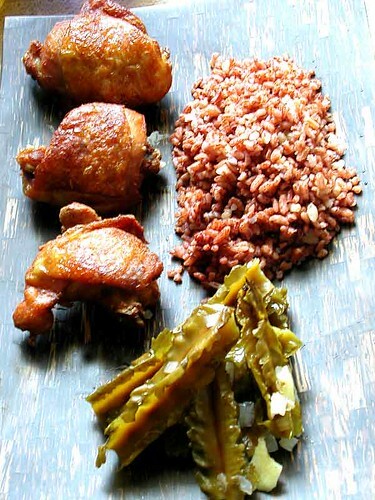 ), so i cooked lunch for pop today: pandan chicken, red rice, and pickled wing beans. the pickles were made by my mom earlier in the week with fresh wing beans boiled in a pickling liquid of coconut vinegar, sugar, ginger, onion, garlic and boonie peppers. they've been sitting in the fridge cooling and curing to piquant perfection. the pandan chicken is a simplified version of the thai khai hoh bai toey, by way of Big G. usually it is fried in pandan leaves, but errrgggh, no, not if i'm doing it and it's super warm out (like it is today). what i like about it is that because the chicken is boiled first, frying time is cut down dramatically, and some of the fat gets rendered out so the skin is wispy and crispy. basic recipe: mix one can of coconut milk with sliced ginger (fat knob), several pandan leaves (or pandan extract), crushed garlic (half a small head), whole but slightly smushed boonie (thai bird) peppers, cracked black pepper, a tablespoonful of salt, the peel of one small lime, and a teaspoonful of turmeric. add a couple cups of water to this, and bring it to a boil then quickly reduce it to simmer. cut up a whole chicken into manageable smallish pieces, add to the coconut milk mix, add enough water to cover the chicken, then bring it back up to a simmer until the meat is just cooked (for a 3lb chicken, it was about 20 minutes). 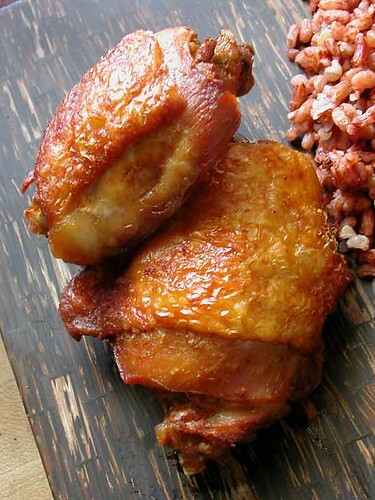 place the cooked chicken on a rack over a baking pan to dry out a little. heat up a few inches of oil in a frying pan or wok, then fry the chicken until funktastically golden crispy. the coconut milk keeps the chicken from drying out, and the spices are subtle, but i think more successfully infused than if it was just marinated cold. this, i think, would be a fantastic picnic fare, as the fried chicken tastes better the next day (as it almost always is). 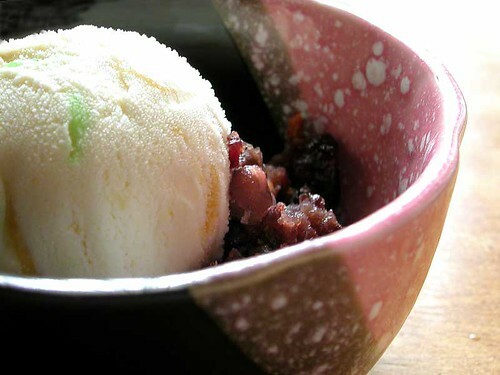 for dessert, a scoop of selecta brand fruit salad ice cream (vanilla with papaya, coco gel, and candied cherries) with a wee bit of anko on the side. 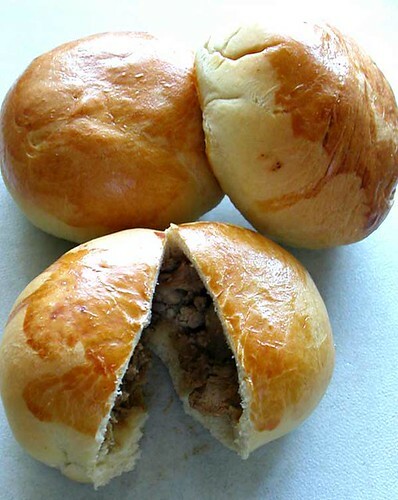 i was having a craving for manapua, a sort of baked meat-filled bun. did a little improvising, searched the fridge, came up with this pork and chicken adobo bun. i shredded the chicken, chopped up the pork, added a little of the gravy (cold, for easier handling). made a dough that was sort of a cross between soft, sweet manapua dough and pandesal by taking my basic bread recipe (1 packet yeast, 3 cups flour, 1-1 1/2 c. water, a little sugar, a little salt, a little oil) and adding a tablespoonful of honey, two eggs, and substituting a half-cup of the water with melted butter. sounds funky, but it worked, as it wasn't too dairy tasting, and the bread was firm enough to hold in the saucy filling. wrapped a couple heaping tablespoonfuls of the meat and gravy in the dough, pinched it closed, put the "dimpled" side down, brushed the tops with an egg wash, and after rising, baked in a 350 oven for 20-25 minutes. perfect on-the-go parcels, if you can resist eating them fresh out of the oven. eryngii mushrooms, the giant oyster variety. creepy in the bob esponja way--part wacky, part baby limbs, a lot spongy, and a lot to answer for. spiceblog's answer was this, and from there i began. 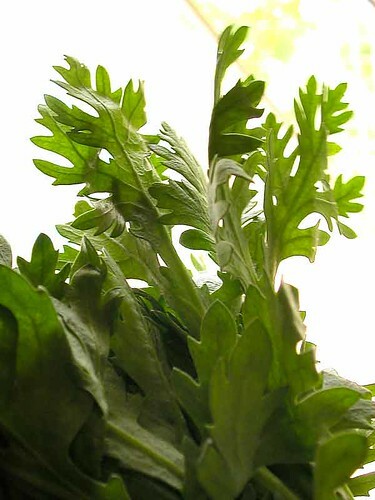 shingiku, or chrysanthemum leaves. these are pretty, don't you agree? if i ever get married--and you will know when that happens when satan knocks, needing a snowboard for his newly icy domain--i would seriously consider incorporating them into the decor. 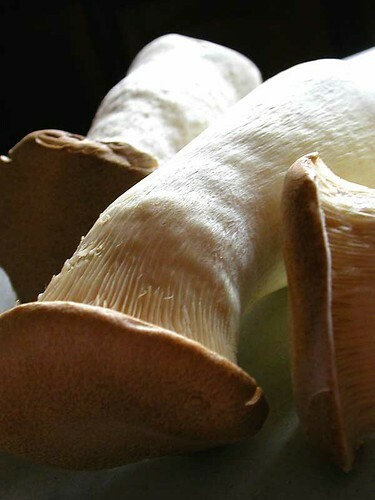 that and clumps of oyster mushrooms. 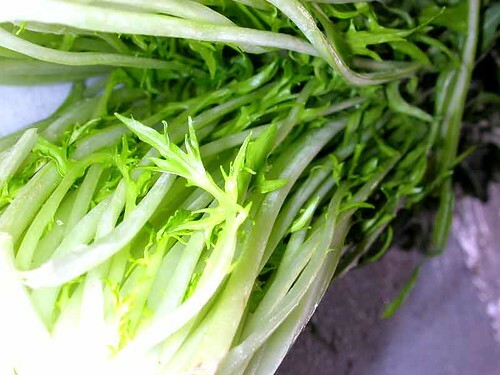 mizuna, or dandelion greens? mustard greens? similar families. either way, i'm led to believe that these are considered weeds. dice the 'shrooms, some onion, a bit end of smoky bacon if you have it. add it to a smokin' hot pan with a mild oil, minced garlic, sautée until softened, the add a dollop of oyster sauce and a dash of sherry until well-coated and cooked through. serve atop a bed of steamed greens drizzled with toasted sesame oil, or as a filling a la jmom's chicken in lettuce cups recipe. the mushrooms are spongetastic but not very meaty, as spiceblog will attest, so this is a much lighter dish than you would think. the greens are considered bitter, but they are not particularly so--just enough edge to even out the sweetness of the mushroom and onion sauté. i was reading through this article about mochi in hawaii when i was working on my imbb entry, and got to thinking about what madness could be created next. it mentions chocolate mochi; i love the idea of it, and probably should have stopped there--warm mochi mixed with melted chocolate is actually quite a divine combination of soft sticky rice cake with little bits of pure chocolate dispersed throughout; cut into squares and rolled in cocoa powder, you might have a winning combination there. it's like a very uniquely textured fudge, and quite addictive. 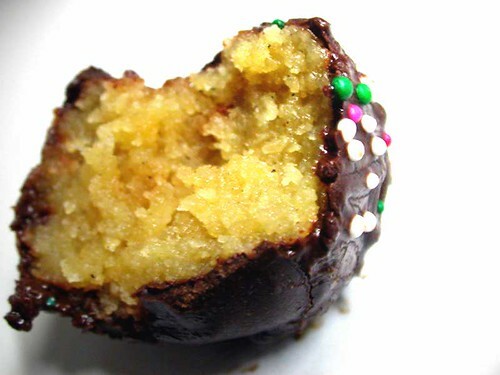 however, the article also mentions peanut butter and i thought, oh ooh, why not, so i mixed up some natural peanut butter with a little kinako (soy flour), and put a dollop along with a bit of chocolate ganache, covered it with the chocolate mochi then rolled it in more kinako. and since it was sitting on the table, i thought i'd add chunks of banana to peanut butter and wrap that up as well. so here it is. i don't know what to say about it. in theory it should be amazing, but actually it's a little disgusting. when it's warm, it's messy, goo-rrific, and the banana's not so tasty. when it's cold, the chocolate mochi's a little like chewing gum. *sigh*. sadly, "a little disgusting" isn't enough of a disqualifier for me, and i find myself craving it just a wee bit as i write about it, so it will probably be made again. IMBB 11 is here, hosted by cathy, and the theme is beans, beans, beans. my entry: the japanese sweet daifuku. azuki, a small, red bean, with a sweet, nutty flavour, has been grown in asia for centuries, probably originating in china. 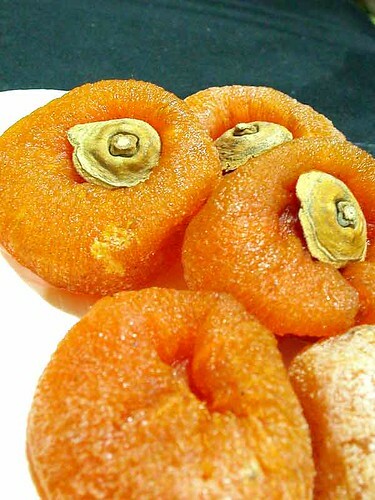 it is commonly used in confectionery items here in asia, and found in everything from sweet soups to baked goods. 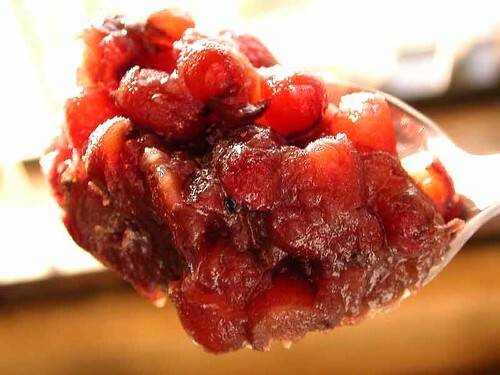 while the concept may be wholly foreign to westerners, azuki makes a wonderful sweet--it is rich and heavy, so it provides a depth beyond sugar sweetness, but it is low in fat and full of fiber so arguably it is better for you than a dessert filled with dairy products or refined flours. 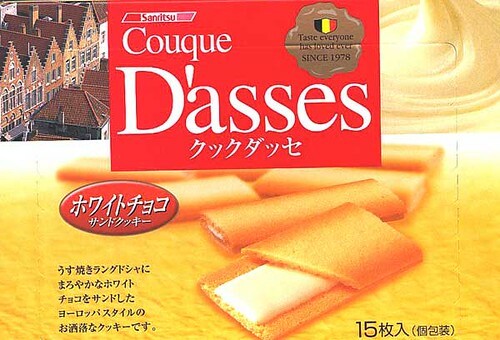 in terms of flavour and texture, i can only think chestnut paste or purée as similar. in japan, the beans are cooked with sugar, and then either used whole (anko) or puréed into a chunky paste (tsubushi-an), or a smooth paste (koshi-an). anko is simple to make. this is a basic recipe (i prefer using palm sugar instead of refined white). 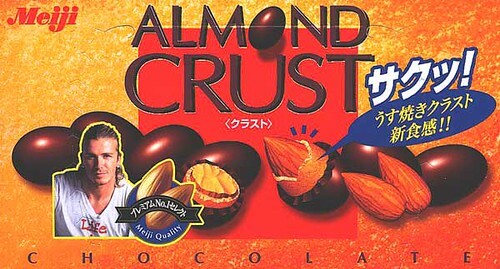 it is this sweet bean that is the basis for many japanese confections. it is used as a filling for steamed buns or baked cakes, as a topping for ice creams and fruit salad, or mixed with jellies or ice and milk. i decided to use this bean paste in daifuku (die-foo-koo), a glutinous sweet rice (mochi) cake with a filling, usually the smooth azuki paste (koshi-an). sometimes other things are added, like fresh fruit, chestnuts, sesame seeds or even peanut butter. 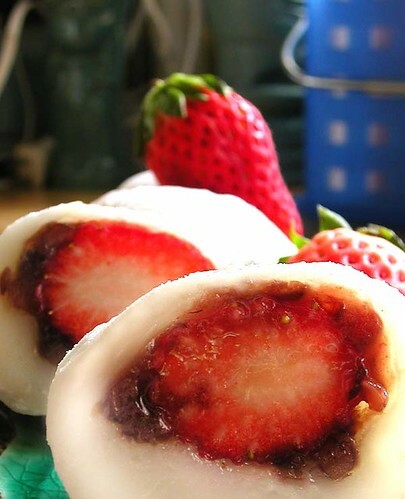 one of my favourites is ichigo daifuku, or strawberry mochi cake. i don't really appreciate koshi-an, and usually there's way too much of it and not enough strawberry, so i made this with a barely mashed scant tablespoonful of anko, wrapped around a monstrous large korean strawberry, then covered with mochi, which i made using this handy-dandy microwave method. it is then rolled in katakuriko (potato starch) to alleviate the surface stickiness. i also made a persimmon variety, since semi-dried persimmons are in the market. these are much softer than dried ones, and the texture is similar to a sticky, concentrated jelly. 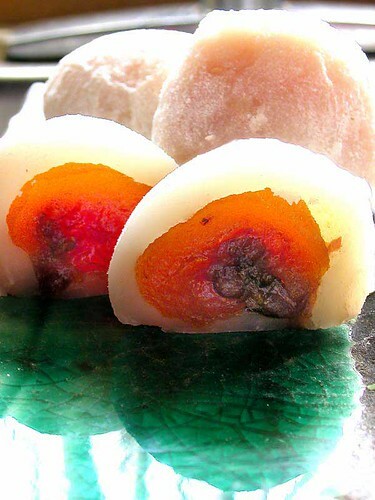 i cut each persimmon in half, filled it with a teaspoonful of anko, pinched it into a closed ball and then wrapped it in mochi. i love the mix of textures--the soft, sticky mochi and the slightly chunky, chewy beans with the cool, cellulose-y flesh of the fruit. 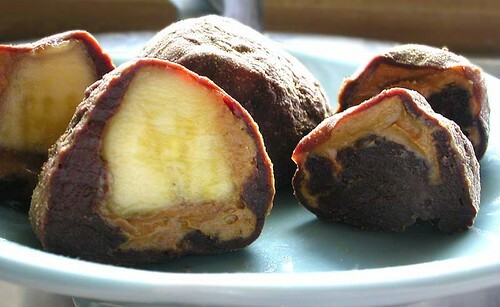 the flavours of the ichigo daifuku are especially pleasing, as the sweet beans somehow manage to make the strawberry tarter and sweeter at the same time, and the mochi, while bland, carries the flavours over, prolonging the little bit of summertime that a good strawberry (or good ichigo daifuku) manages to convey. white peach sherbet, made with whole milk, white peach puree, and peach syrup. 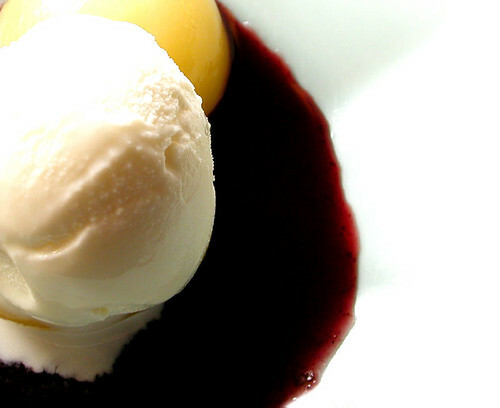 served on white peach halves, with a blackcurrant coulis. i bought a can of white peaches because it was cheap (a buck on sale!) and it has a pretty label. this is what i did with it. i went to the chamorro village last night, and came across a new (for me, anyway) vendor selling mostly drinks, but also a couple of thai food items. 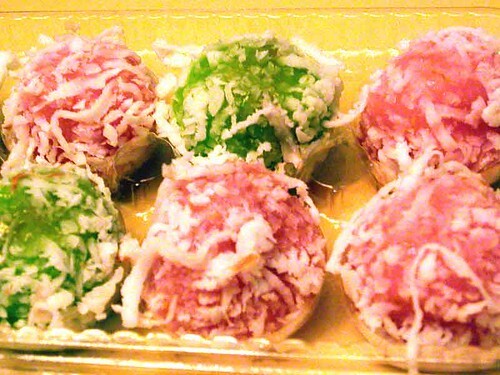 i picked up a little box of kanom tom--mochi/glutinous rice filled with a sort of brown sugared/caramelized coconut, and rolled in freshly grated coconut--and saku sai mu, balls of pork cooked with garlic and peanuts then covered in tiny tapioca pearls. 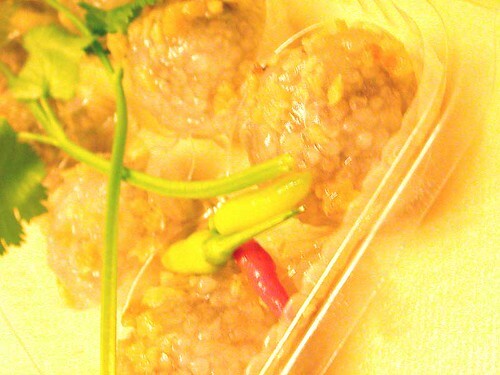 the kanom tom is very similar to the filipino palitaw, but in a much more manageable size and with the interesting filling. it wasn't very sweet, the mochi was tender, and the coconut very fresh--oozing of coconut milk. 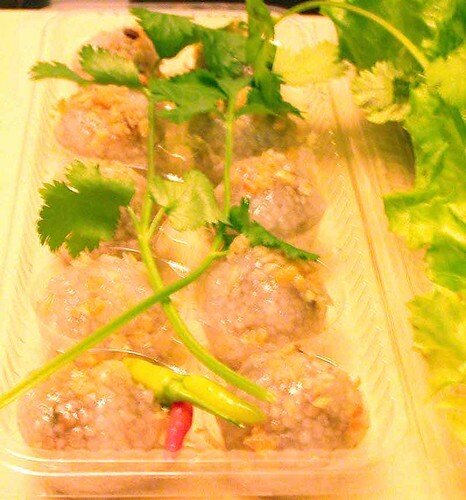 i had never had saku sai mu before, but it looked lovely--little pearly translucent balls nestled in their container like jewels, and served with lettuce, long stalks of cilantro, and the tiniest of boonie peppers (thai bird chiles). 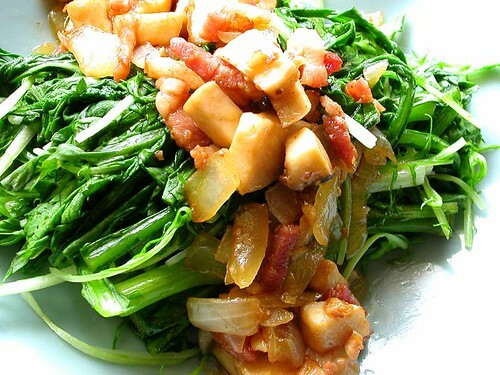 they hold an explosion of flavour in their tiny two-bite core; the finely diced pork is sautéed with cilantro, minced garlic, minced onion, palm sugar, and fish sauce. the flavour is sweet, salty, spicy and savoury all in one. it's a shame that most people just come to his table to buy beverages because these were interesting additions to the standard village fare. next time i'm there, i will definitely check to see if he's got other treats, because these were gems. 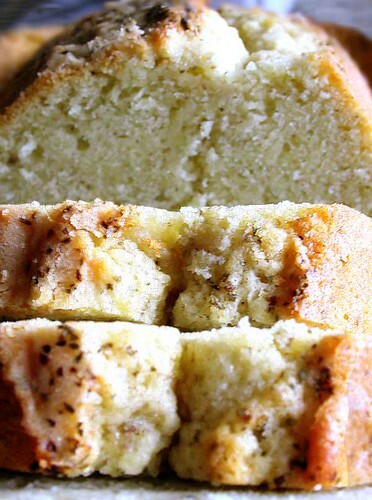 merry and i used to make this lemon thyme tea bread when we were in college; i think i found it in one of the first issues of "victoria" magazine (does that still exist?). i remember the flavour distinctly--intensely lemon thyme-y, with a smooth, fine crumbed cake to back up its herbiness. occasionally we would make the cake with lemon juice, zest, and thyme if we couldn't get the proper stuff. even though i preferred the original, it is actually this version i've come to remember more. i've been craving an herby sweet cake for a couple of weeks now; chika has made several herby cakes, but i wasn't quite sure what herb i wanted or even how herby i wanted it. i decided to use lemon myrtle because i did want something lemony without the acid and without the snicket, and because i happen to have it on hand. i also decided to go with a heavier cake than a sponge or chiffon, so originally i intended to do an olive oil-based cake, but fates conspired and said "you will forget to go to the store and buy olive oil, you will. not. bwaaahaaahaa", so i did. (forget, that is.) i ended up making the first thing in the first cookbook i grabbed, which is nigella lawson's "how to be a domestic goddess", and the recipe was for madeira cake, which sounded like a pound cake, and inexplicably, has no madeira in it. i should tell you i actually used this stuff, of which i added 1 teaspoonful to the cake, and then sprinkled more on top after the cake had cooled, as there's a little bit of advice in there that says it's best used as a finishing spice. that's probably the truth, because even though i used a heaping tsp, i can't really taste anything outside of the butter and sugar of the cake, bar the browned top with the sprinkled bits. there's also something in there that makes my tongue numb, but for the moment i'm enjoying that. the cake itself is fairly enjoyable, but it's not quite what i'm looking for--it's slightly too dense, too buttery, and where the heck is the madeira again? i don't really know if the lemon myrtle really stood a chance with this one. next time i think i'll try that olive oil cake, and i'll let you know how it turns out. 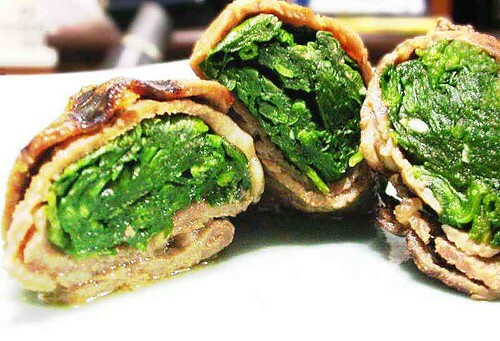 thinly sliced ribeye (if you are lucky to have an asian butcher, look for beef cut for bulgogi or sukiyaki), marinated briefly in white miso paste, dijon mustard, mirin, sesame oil and soy sauce, wrapped around sautéed spinach with garlic, then grilled. mmm. beefy goodness, without the beefy bloat. the meat is cut so thinly (1/8th of an inch), and the marinade rather strong, that a couple minutes of marination should be enough to flavour the meat well enough that extra sauce isn't needed. made some juvenile shopping purchases at the japanese market. beckham's nuts have gone crusty. ah, i love a curry bento on rainy days. japanese curry is sweeter, thicker and not as spicy as other curries, and is almost just a condiment to accompany your starch of choice. this particular curry was very mild with chunks of carrot, radish, and potato. this bento has potato (poteto) croquettes instead of rice, as well as a cabbage salad and a little bit of pickle. needs more pickle. good thing i have a jar of pickled shallots at work just for this lapse. 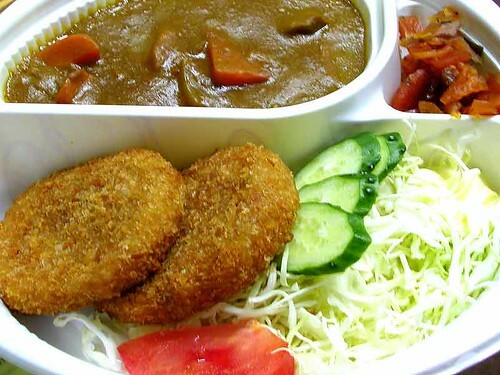 i have to say, though, one of the most attractive things about the curry bento is the packaging. 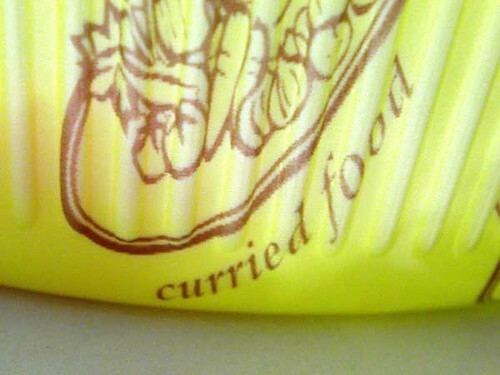 look, i have a package of curried food! 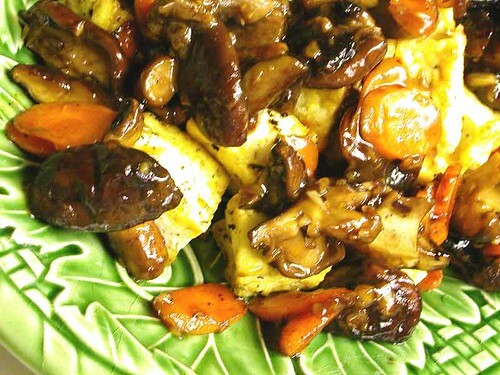 fresh shiitake mushrooms, something called korean brown mushrooms, carrots, and tofu, stir-fried in a soy-mirin-sesame oil sauce with garlic and ginger. i wanted something a little sweet for dinner, but not overwhelmingly so; the sweetness comes from the main ingredients, not from the sauce, which was very mild. 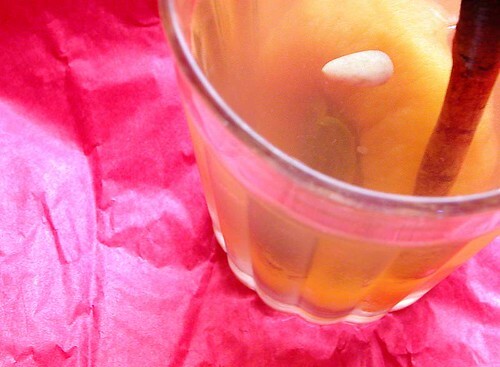 my version of the korean drink sujonggwa, a traditional persimmon punch. it is made with dried persimmons, ginger, and cinnamon. it is served cold, although i imagine this would be lovely to sip warm on a wintery day. cardamom pods--> SHF#3:spice up your life winter hosted by zarahmaria--> baby spice aka emma bunton's "crickets for annamaria"--> all the colours of the world! every boy and every girl!--> ginger spice's bodacious bonbons--> cardamom-infused cream fudge coated in chocolate and multicoloured sprinkles. yes, well, no one said i didn't have dubious tastes. i was making a simplified version of badam barfi, an indian confection normally made with ground almonds, ghee, sugar and cardamom, but i couldn't find the edible silver leaf that it is normally coated in. nor could i find gold leaf. since i made it for the holidays, i had to use something a bit special, but without the leaf, what would be the next best thing? what would baby spice do? probably nothing--maybe get the hell out of the kitchen--but i believe the precious materials pecking order goes something like diamonds, gold, silver, chocolate, and diamonds were out of the question. so instead of the normal lozenge shape that the badam barfi is normally formed into, i made them into small bonbons and dipped them in callebaut dark couverture chocolate. then sprinkled them with hundreds and thousands because i think they are highly underrated and very, very pretty. (and no, not like baby spice who is only slightly underrated and almost pretty). place the cream, milk, and crushed cardamom pods into a saucepan. bring to a boil and cook until thick enough to coat the back of a spoon. strain out the cardamom pods. bring back to the heat; add sugar and cook until dissolved. while stirring, add the ground almonds and salt. continue to cook and stir until the mixture pulls away from the sides and forms a stiff dough. 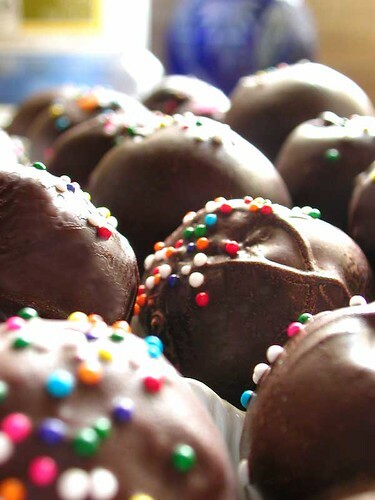 form dough in a shallow pan and cut into diamonds, or roll into small balls and dip into chocolate. 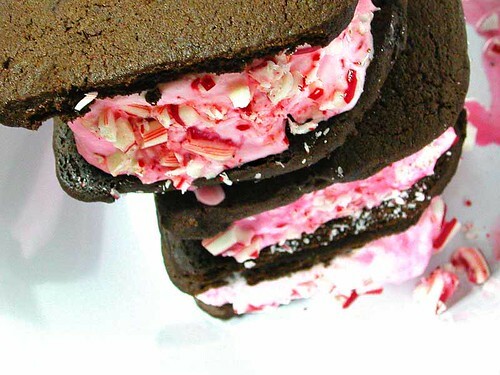 chocolate cookie ice cream sandwiches with peppermint ice cream. those ginger snaps didn't really do it for me flava-wise, so instead of messing around with finding something gingery i'd like, i omitted the ginger and cloves altogether, added a half-cup of powdered cocoa (or was it a cup? ), and mecca lecca hi mecca hiney ho! i gots me some funky cinnamon chocolate cookies. i made a double batch to fill a loaf pan to get double-wides, paired 'em off with some peppermint ice cream, rolled 'em in crushed candy canes, and here's my new favourite xmas treat. anthony from spiceblog's got that end of the month egg on toast on a plate (hopefully) #2 thingo going on. even though as i type i am indulging in an egg dinner (more kylie by way of oslo foodie than anything), there is no toast, not even a plate. and no audience today, ta. however, i do have this lurvely sticker set which i bought from the little korean store next to the boba place with the coconut toast and melon ice, so props all around. 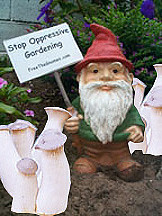 have i told you i'm a lousy gardener? i can get stuff to sprout but beyond that...well, it's a good thing i like sprouts. i have a tiny bit of a black thumb, thumbelina, rasputina of the garden. 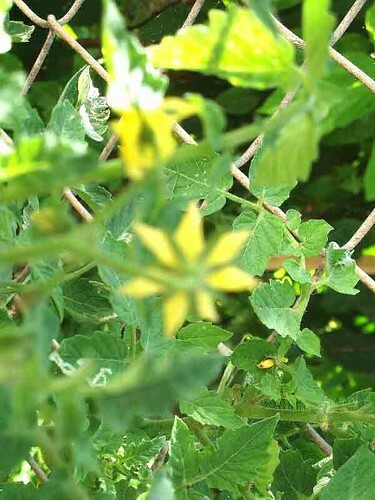 and i cannot seem to take a focused photo of the tomato plant flowers, but crikey, ook, look, there they are. pretty. a wonder. cross fingers and toes, please, that these may find success amongst the ruins. despite being battered mercilessly from supertyphoons and tropical storms, despite precariously leaning at an angle that would make a limbo dancer proud, despite being a harbour for brown tree snakes and being subjected to frequent whacks of my nine-iron as i aim for the serpents' heads, my parents' backyard mango tree has managed to yield three fruit this year. that's three more than last year, and two more than the year before. huzzah! 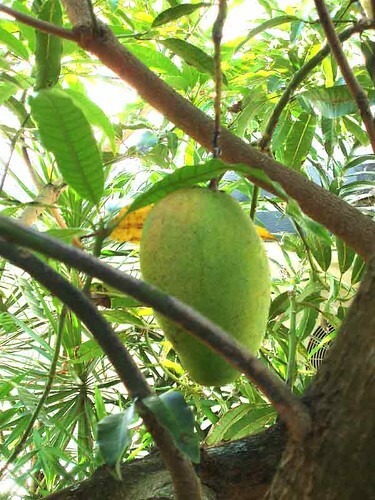 all hail the mango tree! if it isn't painfully obvious that i've got the attention span of a gnat and that i like to juggle spinning plates on sticks along with heirloom pottery, you haven't been paying attention. 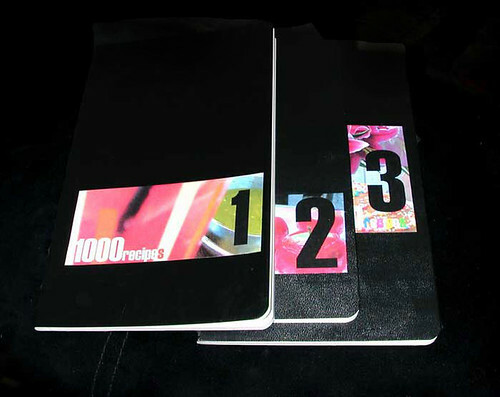 i've decided to start yet another project, this one a travelling journal/recipes thingy thingo thingaroonie. if you are interested, or interested in seeing that I Actually Know Where The Shift Key Is On The Keyboard, then take a look.